Scores of intricately eroded creatures greet visitors to Goblin Valley. Hike among intricately eroded rock formations in haunting coves in this photographers&apos; paradise. Adjacent to the park, off-highway vehicle enthusiasts will find hundreds of miles of dirt roads to explore.<P>Goblin Valley State Park is in Emery County between Green River and Hanksville off State Route 24. Facilities include a 21-unit campground, modern rest rooms, hot showers for campers, sanitary disposal station and visitor observation shelter. 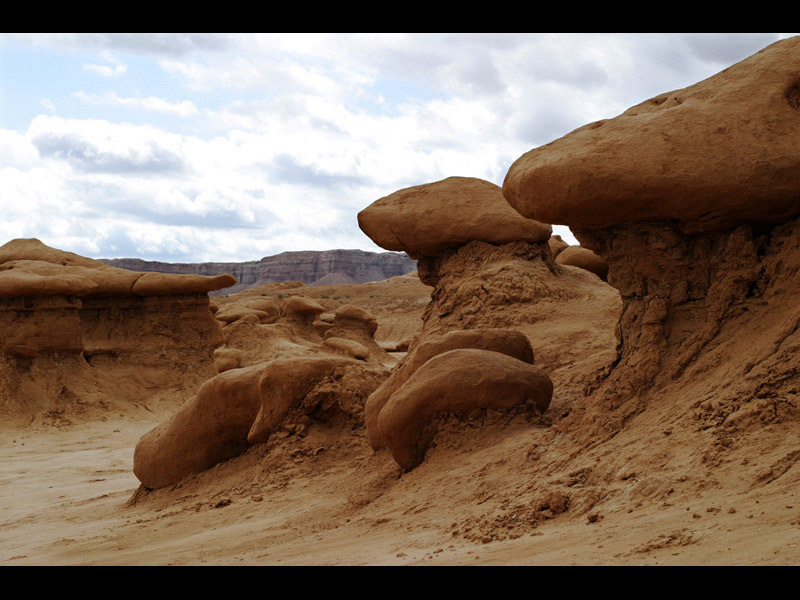 Cowboys searching for cattle were the first Anglos to discover the secluded Goblin Valley. Then in the late 1920s, Arthur Chaffin, owner/operator of the Hite ferry, and two companions were searching for an alternative route between Green River and Cainsville. They came to a vantage point about a mile west of Goblin Valley and were awed by what they saw, five buttes and a valley of strange-shaped rock formations surrounded by a wall of eroded cliffs. In 1949, Chaffin returned to the area he called Mushroom Valley. He spent several days exploring the mysterious valley and photographing its scores of intricately eroded creatures. The area was acquired by the state of Utah and in 1964 was officially designated a state park. 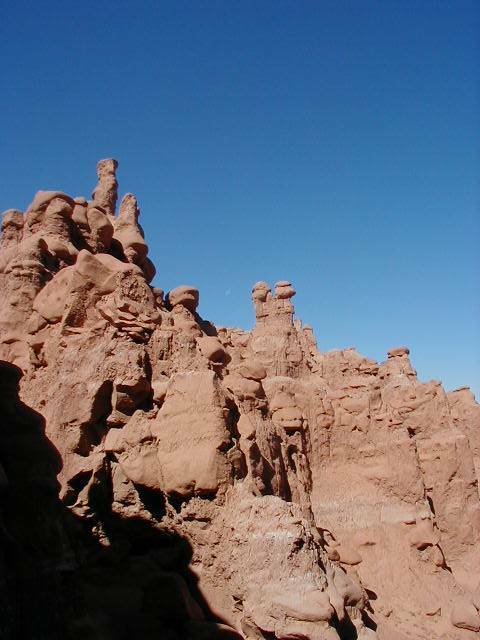 Goblin Valley State Park is a showcase of geologic history. Exposed cliffs reveal parallel layers of rock bared by erosion. Because of the uneven hardness of sandstone, some patches resist erosion much better than others. The softer material is removed by wind and water, leaving thousands of unique, geologic goblins. Water erosion and the smoothing action of windblown dust work together to shape the goblins. Bedrock is exposed because of the thin soil and lack of vegetation. When rain does fall, there are few plant roots and little soil to capture and hold the water, which quickly disappears, in muddy streams without penetrating the bedrock. Have never seen anything like this. A great place in the middle of noplace. 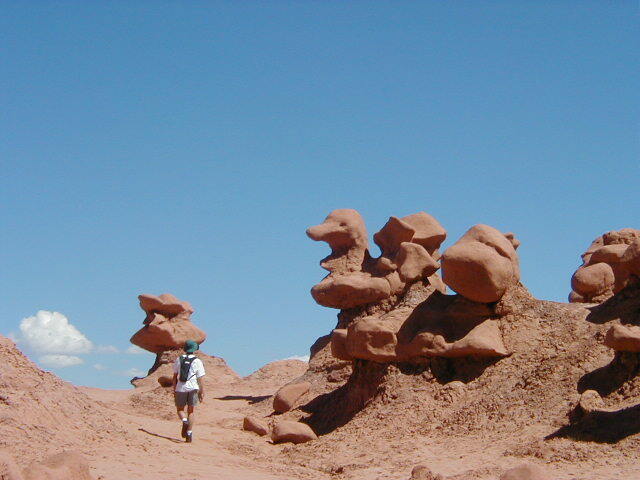 I went to Goblin Valley several years back by accident and came to a strange and wonderful land. It is a combination of Alice in wonderland and a strange planet. I was expecting some weird little people show up to take me to their ruler. It is full of red mushroom looking little towers. Take your camera and your children. 19.5 miles north of Hanksville on Utah 24 to the Temple Mountain junction, then five miles west on signed, paved road, and seven miles south on newly paved road to park.